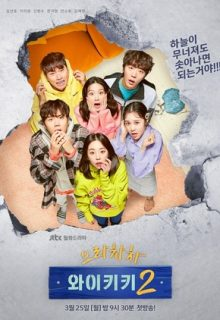 The second season of the popular sitcom “Eulachacha Waikiki” will depict the friendships, love and dreams of a group of young people at “Waikiki”. Lee Joon Ki (Lee Yi Kyung) is an unpopular actor who runs a guest house called “Waikiki”. However, his guest house is facing bankruptcy due to bad business. To revive the guest house, Lee Joon Ki turns to his high school friends Cha Woo Shik (Kim Sun Ho) and Kook Ki Bong (Shin Hyun Soo) for help. Cha Woo Shik is a picky guy who dreams of becoming a singer. Kook Ki Bong used to be a promising baseball player who is now stuck in the minor league. After Lee Joon Ki’s request, the two friends then invest all their savings in the guest house and move there. Along with these 3 men, three girls also begin to live at Waikiki. Han Soo Yeon(Mun Ka Young) was the most popular girl in high school. After an unsuccessful incident on her wedding day, she ends up at Waikiki. Kim Jung Eun(Ahn So Hee) is Joon Ki’s classmate in the theater and film faculty at school. She takes on any job to make ends meet. She is sincere and unusual, but she does not have tolerance for everything disgusting. Cha Yoo Ri(Kim Ye Won) is Cha Woo Shik’s older sister, who dreams of becoming a chef. She heads the “food chain” of the guest house, using all the guys for her own purposes.